On the night of February 28th I was cruising around a few different websites to see what was going on in the design scene to mark my calendar for upcoming events that I wanted to attend. My heart sank when I realized that Mona Hajj had been in Los Angeles at Rose Tarlow's showroom that very night and I had missed it. She was speaking about the last decade of her work and discussing before and after photos. I'm sure it was amazing and I can't believe I missed it. I first took note of Mona's work when she was featured in the June 2006 issue of House Beautiful (shown below), the "Giants of Design" issue. That issue of House Beautiful was really significant for me in that it changed the way that I looked at interiors and what kind of designer I wanted to become. It really opened my eyes to the kind of amazing rooms that designers were creating. I hadn't started my own business yet, but it's quite possible that that single issue was the start of it all. Mona Hajj has a traditional aesthetic, but you'll notice that all of her interiors still have a contemporary feel to them, which I love. I think walking that fine line between traditional and current is a really difficult thing to accomplish, but she does it with such grace and perfection. 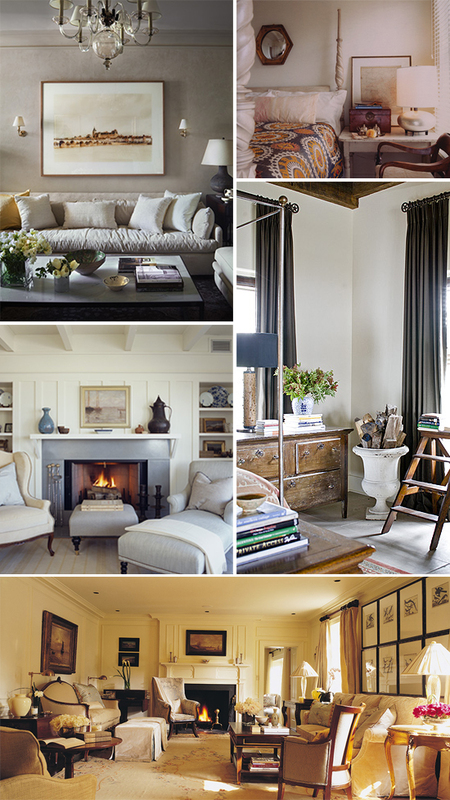 She creates warm, timeless interiors, that are free from the latest trends and ubiquitous geometric fabric patterns. Mona, next time you come to town to speak, I'll be there in the front row. Stunning. That is my kind of design. I love classic esthestics that are not too formal but feel warm and cozy but can be sophisticated without being stuff. I find some designs far too trendy and when i make a personal investment whether it's clothes or furniture I want to be sure in 5 years it's still in style. Love her design - classic without being overly frilly. Great post. Love all those rooms.